The ID is used through out the Rocrail program as a unique key for referencing this signal and is therefore very important. If you change the ID you must also edit the defined block settings. This number is used for mapping a switch command by address to this signal for flipping it. The predefined Decoder to which this object is connected. This is optional and for documentation only. 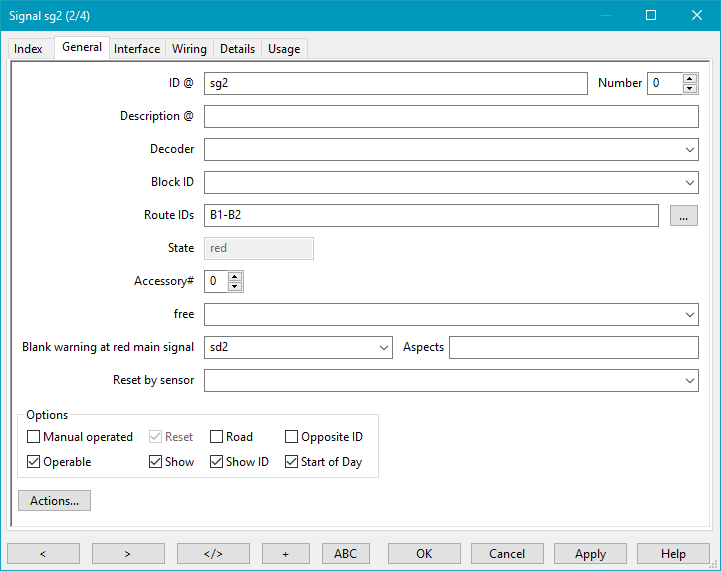 If the signal symbol has an occupancy representation it can be activated by linking this to a block, sensor or output, but normally it is linked to the block which it belongs to. Route IDs are for showing the locked routes using the route representation or the occ if no symbol is found. This is a list of comma separated Route IDs without white space (blanks). If one of the IDs has become locked the route representation will be shown. Read only field to show the current state: <undef>, green, yellow, red, white. Only for signals with less then 5 aspects. Additionally the suffix "-occ" or "-route" can be added. The Use Prefix and Block state must be disabled. A Block, Sensor or Output object which must be free/off to accept commands to change the aspect. Only a red command is allowed if the object is not free. Switch off all bulbs of the distant signal entered here if this main signal switches to the red aspect. Other aspects will be stored during the blank and the correct aspect of the distant signal is shown when this main signals switches to a other aspect than red. Used to influence the trains in auto mode if the signal is linked to a block. With manual operated signals in auto mode it is possible to control the progress of running trains. Manual operated signals can't be set by the auto mode process but only by hand. However, these signals can be controlled by actions in auto mode. If set to the red aspect the train will be waiting until it is set to none-red by an operator. If set to the yellow aspect the train will travel at Vmid. The signal will be set automatically back to red when the train passes the signal. No train can reserve the block if the distant signal is red. This option is default and is responsible for setting the manual operated signal automatically back to red when the train passes the signal. If this option is disabled the signal must be reset manually. Shows the Road representation of the signal. The turnout ID is visible in the plan. To prevent manual operation by clients. If checked the signal object will be shown in the trackplan at the given location.